Franklin Matters: What will Franklin be like in 2028? What should Franklin look like in 2028? That would be the 250 year anniversary of the creation of Franklin separating from Wrentham. 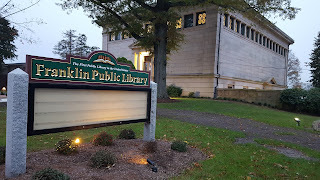 You likely recall the story that it was originally to be called Exeter but on the way to Boston, they changed the name to Franklin to honor the work of Benjamin Franklin. When the founding fathers asked Ben for a bell to toll in his name, he responded with a bunch of books and hence our library, the first public library in the nation was formed. We have this legacy to live with and keep up. 2028 is only 10 years away. It will be here before we know it. Hence, there is no time like the present to start thinking about what the town should look like. How it should operate? The new school superintendent, Sara Ahern is embarking on a process to update the mission, vision and strategic plan for the schools. The Town or municipal side should do the same thing. We have a current Master Plan. We have a current Open Space Plan, We also have budget challenges. How are we going to deal with our OPEB obligation? How are we going to repair our roads? How are we going to maintain or advance our fire, police, and DPW services? How are we going to provide services to our growing community? And of course, how are we going to fund the schools to give our children the best they can get to prepare them for the world of 2028 and beyond? We can do something now. The biennial Town Election is coming up November 7, we should make sure to select those with the vision and or the willingness to work on where we need to be in 2028. The Fiscal Year budget for 2019 is supposed to be a challenge. That should give us all the more reason to select the proper folks to lead us forward. Starting now. Talk to the candidates. They are your neighbors. Find out what they want to do. Find out how they are going to get us to 2028. And then vote on November 7. It is the one thing you need to do right now!